We are a leading Manufacturer of acarjohn tablets from Mumbai, India. 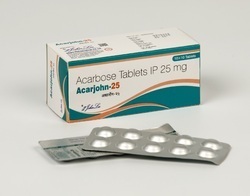 Acarbose is used with a proper diet and exercise program to control high blood sugar in people with type 2 diabetes. Controlling high blood sugar helps prevent kidney damage, blindness, nerve problems, loss of limbs, and function problems. Proper control of diabetes may also lessen your risk of a heart attack or stroke. Acarbose works in your intestines to slow the breakdown and absorption of carbohydrates from foods that you eat. This effect helps lessen your blood sugar rise after a meal. Diarrhea, gas, or abdominal discomfort/pain may occur as your body adjusts to this medication during the first few weeks. These side effects usually lessen with time.